You might remember hearing about the global warming “hiatus” a few years back — a pause in Earth’s inexorably rising temperature, which some used as evidence that climate change is a hoax. But scientists are now completely sure that the pause never happened. And we know exactly where the missing heat wound up. Over the summer, we reported on a study by NASA’s Jet Propulsion Laboratory, which used two decades of observational data to show how the oceans have been re-distributing heat since the early 2000s. Specifically, the researchers found that heat has been sinking, from the surface of the Indian and Pacific Oceans into deeper layers. Now, an independent team of researchers at Lawrence Livermore Laboratory has come to the same conclusion, by looking at a much longer historic record. Their analysis, which appears this week in Nature Climate Change, puts the current ocean warming situation in dramatic relief: over the last 18 years, the oceans absorbed roughly the same amount of heat from global warming as they did over the entire 20th century. 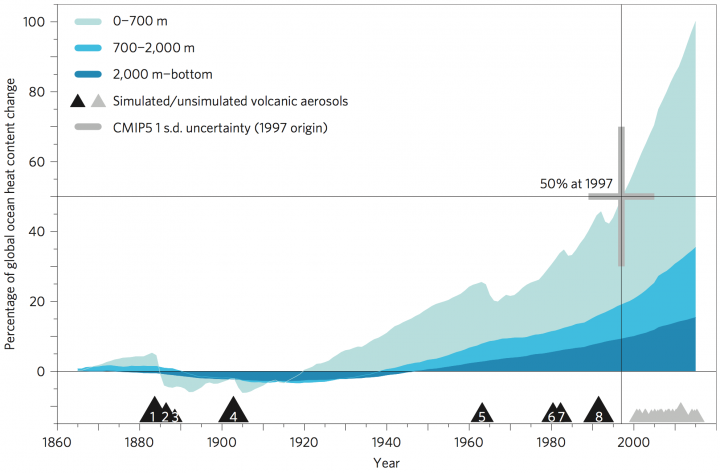 What’s more, the rate of deep ocean warming is fast accelerating. That could impact everything from marine ecosystems to global sea level. It’s easy to overlook the deeper layers of the ocean, beyond the zone where light can penetrate. Yet this murky region of our biosphere has a key role to play in regulating Earth’s thermostat, by carrying currents that redistribute heat and energy everywhere. Even small changes in the temperature of the deep ocean could have dramatic global feedbacks, which is why scientists recently started asking whether anything has changed. Pulling together data from diverse sources, including the 19th-century Challenger expedition and a new fleet of monitoring devices called deep Argo floats, climatologist Peter Glacier and his colleagues have now tracked changes in the energy balance of the ocean over the past 150 years, creating the longest continuous record of what’s happening at different depths. Overall, they found that nearly half of the industrial era-increase in global ocean heat has accumulated in the last 18 years. That may sound pretty dramatic, but according to study co-author Gregory Johnson of the National Oceanic Atmospheric Administration, it’s perfectly in keeping with the rise in fossil fuel emissions over the 21st century. What’s more, a full 35 per cent of that heat has sunk to below 700 meters in depth — eluding measurements and inciting claims of a warming “hiatus”. But hang on a sec. If a lot of the heat we’re producing is ending up deep beneath the ocean’s surface, isn’t that a good thing for us? Not exactly. Even a small uptick in the icy temperatures of the deep ocean will cause water to thermally expand. “Because seawater expands as it warms, deep ocean warming means rising seas, which impacts coastal communities and infrastructure,” Johnson told Gizmodo in an email. Gawarkiewicz adds that warming will affect fragile deep ocean ecosystems, including cold water corals, as well as large-scale atmospheric and ocean circulation patterns.